If I scarred you for life, i’m sorry. 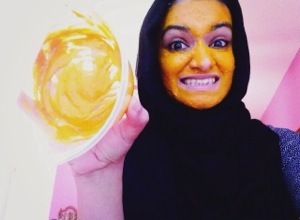 If you’re still here, please read below on how to make a cool, fun, YELLOW face mask! 1. Mix all the ingredients together and add milk* until you create a thick paste. 2. Use your clean fingers to spread the paste all over your face. 3. Let the face-mask set for about 15 minutes or until it becomes hard. 4. Rinse off the mask with warm water and rub your skin in a circular motion as you take it off. 5. Once your face is washed, if you have a yellow hue to your skin and are having a mini-heart-attack, use a cut lemon to rub your face or rinse with your daily facial cleanser. Try this mask and hashtag #ilaamsamask on your instagram!